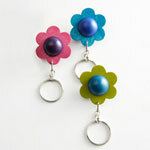 For understated elegance, these wooden drop earrings would make an lovely gift for your mum this Mother's Day. Oulu earrings are one of the latest designs by Aarikka. As you would expect from Arctic Fashion, all designs in our wooden jewellery collection are made from sustainable materials and these earrings are no exception. What makes them different, however, is their unique colour and simple, effective design. 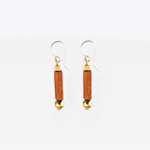 An earthy twist on classic straight drop earrings, Oulu wooden earrings have brown oblong-shaped wooden beads held in place by circular gold-coloured beads and silver hooks. A warm combination of gold and brown, these earrings are a refreshing alternative to pure wood and silver metal designs. Ideal for ladies who prefer gold to silver coloured jewellery, these special earrings are lightweight and great value at only £14.00. Show your mum how much she means to you with a special gift from Arctic Fashion. From elegant wooden earrings to stylish accessories for the home, Arctic Fashion can help you find that perfect gift.